WABCO Showcases Differentiating Safety and Efficiency Technologies at Agritechnica 2017 | MICO, Inc.
HANNOVER, Germany – November 10, 2017 – WABCO (NYSE: WBC), a leading global supplier of technologies and services that improve the safety, efficiency and connectivity of commercial vehicles, will showcase its industry-leading technologies at Agritechnica 2017, the world’s leading trade show for the agricultural machinery industry. The trade show will take place from November 12-18 in Hannover, Germany. WABCO will present its latest, differentiating systems that enable equipment manufacturers to advance automation for agricultural and off-highway vehicles. Building on its success as a key system integration partner to the commercial vehicle industry, WABCO will showcase leading technologies in detection, control and actuation that will improve safety and efficiency for agricultural and off-highway vehicles, as well as build capability to support autonomous driving. 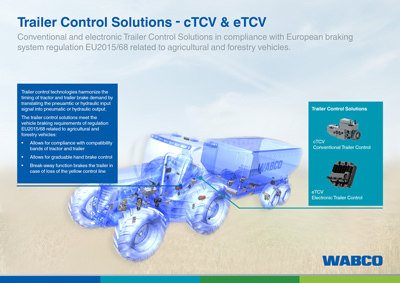 WABCO will feature its suite of solutions specified to meet vehicle braking requirements of the new regulation EU 2015/68 for agricultural and forestry vehicles. Effective in January 2016, this regulation raises safety standards for agricultural and forestry vehicles to a level similar to that of commercial trucks and buses, mandating the use of anti-lock braking (ABS) for all new vehicles with driving speeds of over 60 km/h. The company will also showcase conventional and electronic Trailer Control Solutions for agricultural tractors, presenting the widest portfolio available to meet a range of vehicle applications and hydraulic pressure requirements. WABCO will highlight its unique position as the only supplier for both hydraulically and pneumatically braked vehicles as it features its electronic brake system platform for agriculture vehicles. The platform includes ABS functionality which is tested and certified by TÜV Nord, a global leader in security, inspection and certification services. WABCO’s advanced ABS enables additional functions that create a safer and more efficient driving experience, including traction control, hill start aid, anti-jack-knife control and others. WABCO’s presence at Agritechnica 2017 follows its February 2016 acquisition of MICO, Inc., a global market leader in hydraulic components, controls and brake systems for heavy-duty, off-highway vehicles in agriculture, construction, mining and similar industries. The powerful combination of MICO’s hydraulic technology with WABCO’s strong position in advanced technologies enables WABCO to serve as a proven systems integration partner to the global off-highway industry. Visit WABCO in Hall 16, Booth B16 at the Hannover exhibition grounds from November 12-18, 2017. Press Photo / Caption: WABCO will showcase its industry leading safety and efficiency technologies at Agritechnica 2017, the leading trade show for the agricultural machinery industry. The industry’s only supplier of electronic brake systems for both hydraulically and pneumatically braked vehicles, WABCO will present its electronic brake system platform for agricultural and off-highway vehicles, as well as its conventional and electronic Trailer Control Solutions for agricultural tractors. WABCO (NYSE: WBC) is a leading global supplier of technologies and services that improve the safety, efficiency and connectivity of commercial vehicles. Founded nearly 150 years ago, WABCO continues to pioneer breakthrough innovations for advanced driver assistance, braking, stability control, suspension, transmission automation and aerodynamics. Partnering with the transportation industry as it maps a route toward autonomous driving, WABCO also uniquely connects trucks, trailers, cargo, drivers, business partners and fleet operators through advanced fleet management systems and mobile solutions. WABCO reported sales of $2.8 billion in 2016. Headquartered in Brussels, Belgium, WABCO has 13,000 employees in 40 countries. For more information, visit www.wabco-auto.com.